Welcome, Luke Beno of Analog.io! Analog.io is a data collection and charting website where you can view and share datastreams with others. Luke entered Analog.io (including a hardware component) into The Hackaday Prize. 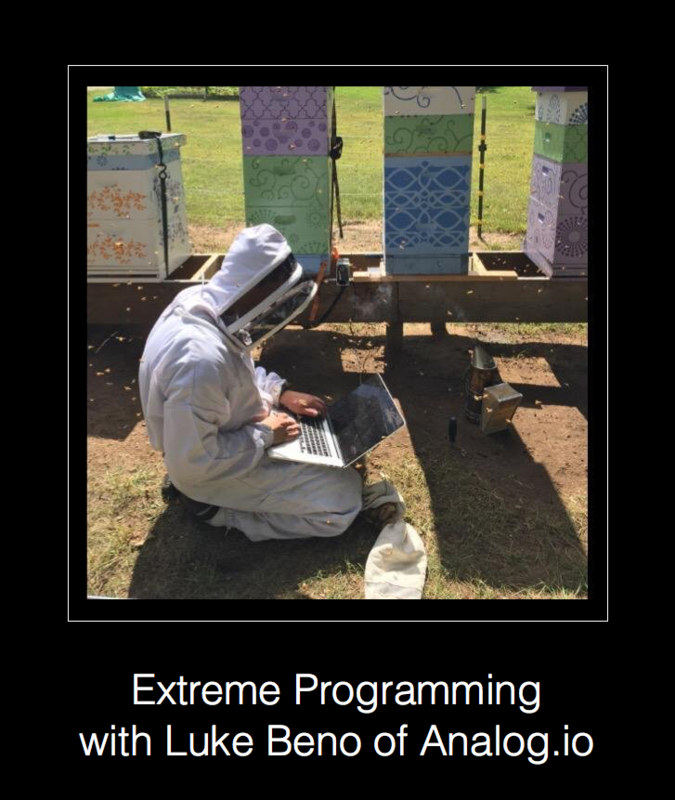 This is used for keeping track of lots of data over time, but Luke uses it for tracking beekeeping. The site does not directly collect data, currently Analog.io pulls mainly from data.sparkfun.com. That server runs the open source phant.io. Luke says it’s easiest to get started using an Electric Imp or a Particle board. The boards make http requests which get recorded by phant.io. Notification based upon trigger levels is not currently supported. As platforms get larger, holes in server reliability become more apparent. Dave and Chris have been reading Free by former guest Chris Anderson. One example of a likely purchaser of services would be monitoring temp/humidity of vacation home (making sure the heat isn’t broken). There was a kickstarter about a bee hive with a direct tap. Other similar platforms include xively and thingspeak. Luke has a tutorial for getting up and running using a tiny temp/humidity board and an electric imp. The service used to be called imp.guru, but changed names. The electric imp uses a server/agent scheme. You don’t always need to use an Electric Imp, it just makes compiling and downloading (or updating) code easier. Instead, Luke targeted a lower power solution using a sensor node built with an MSP430 and an NRF24 radio. The base had another NRF24 radio and an ESP8266 to talk to the wifi network. Google is making a new router called OnHub. Chris sees parallels to Distributed Control Systems. The day of recording is BTTF day (Oct 21st, 2015). Dave was very concerned about power consumption. MQTT has a “broker” that acts like a satellite. Anyone subscribed to the broadcast message will get the data packet that is submitted by a device. SmartThings was bought by Samsung and acts as a connected home router. LoRA has 7 mile low power RF coverage. There is a kickstarter for this with the Things Network. APRS is a ham radio version of multi node system. Luke utilized the 43oh.com forums to build his system. He programmed using Energia for the MSP430 (arduino style). Analog.io is Ruby on Rails. In his day job, Luke is an ASIC architect for Triad Semiconductor. He attempted to answer why aren’t there low pin FPGAs with tons of resources like Dave wants (some are starting to hit the market). Accessing all the differet servers/services, each with it’s own API (Rest, mqtt, QEST, etc) seems like there’s a need for a common api standard. I know companies like temboo can do some of it (like accessing Analog.io’s highcharts, plot.ly, etc), but it can’t do data.sparkfun. Then when the Wink/LinkIt of the world move on, you can more easily move your solution to a different backend. Is this Luke’s distributed sensor hackaday project mentioned in the show? Any tutorial for the Electric Imp Squirrel / Lua scripting language? That launchpad demo is great! @RU4MJ12, obvious place seems to be the main source of info – http://squirrel-lang.org/ It’s like JS, but compiled. I tried using the more official documentation and I just didn’t find it very readable. For those coming from stock Arduino libraries there is a reference on the imp site of important differences in program structure. Great discussion.. Hey he does have a consumer market, the bee keepers. Commerce does want that data, they are customers, please joe blogs take a back seat with internet of things settles, let the grown ups have the data first!! MQTT is pretty awesome. I’ve used the Mosquitto http://mosquitto.org/ broker on a few projects. It definitely lets anyone listen in if they know what topic(s) to subscribe to. What I have done if you don’t want that default behavior is to use TLS Certificates to authenticate clients to the broker, and build an Authorization ACL structure to determine who can publish/subscribe to topics, as well as bridging brokers together. Neat stuff!